This past weekend our house was christened with it’s first official “local” guests! These were’t our first guests ever – my parents helped us move and stayed with us for a while, and Rebecca (my good friend from Chicago) came to stay with us for a few days just before the holidays. But on Friday night we had our first locals over to the house! It was exciting for us since we love to cook but for some reason we rarely entertain company. Kirk is in a band (he’s clearly way more social than I am). He’s a drummer, and in the time since we moved here he already joined a band, just like that! Can you believe it? I don’t know really how the whole music/band thing works, but apparently it’s a good way to meet some pretty cool people. So, we had two of his band-mates over for dinner. As it turns out, they appreciate Chicago-style deep dish pizza, and that is something Kirk and I are actually pretty good at making. We’ve been working on recipes for the last several years, and we’ve got it down pretty good. The pizza turned out pretty good – though our crust recipe oddly turned out really light and airy, which was kind of unexpected (could it have something to do with the elevation difference here in Tucson versus Chicago?). It was still good – just different than we expected it to be. The cheese carmelized nicely, and the sauce was tasty in all of it’s tomato goodness. But, I’m not here to talk about pizza – I think Kirk and I still have some work to do now that we’re living in a new environment. Bread recipes can be really finicky like that, and it seems like our crust might need a little re-working. What could be better, really? 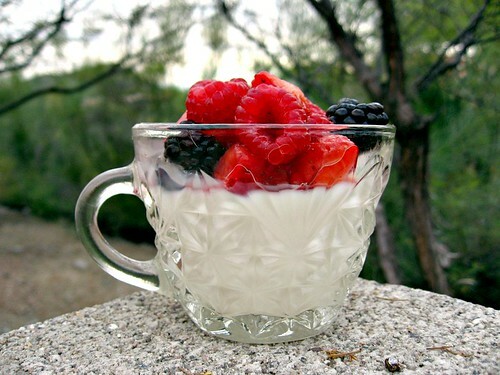 Quite simply, it’s a dessert made of gelatin, heavy cream, sugar, and vanilla. That’s all you need. It’s so insanely easy, I have no idea why more people don’t make it at home (except for the fact that they don’t want to feel like they’ve immediately gained 5lbs from eating it). 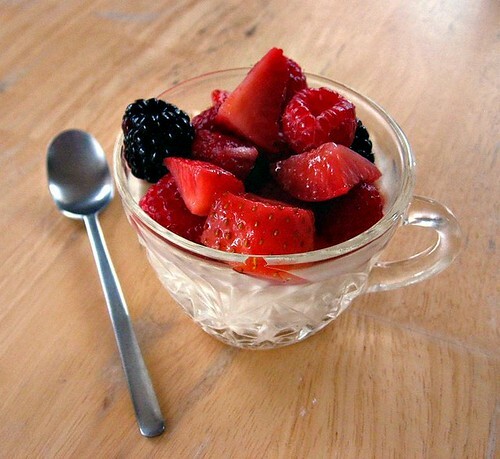 Serve it in a beautiful glass, spoon some fresh fruit on it, and there you have it. 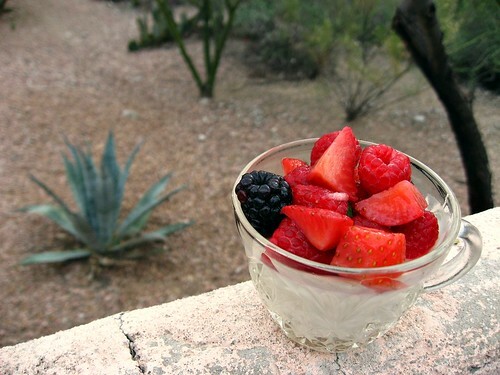 It just might be one of the easiest desserts ever! I should warn you that the cream is absolutely decadent. 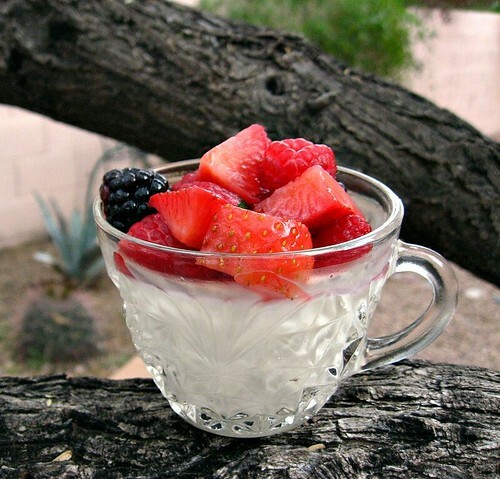 Panna Cotta is so incredibly delicious it’s addictive. This recipe makes enough for 8 servings. I’m not going to lie… we enjoyed the leftovers for the remainder of the weekend. Sprinkle the gelatin over the cold water in a medium-sized bowl and let for about 10 minutes. While the gelatin is absorbing the water, heat the heavy cream, sugar, and vanilla extract in a saucepan. Once the sugar is dissolved, remove from heat. Pour the very warm Panna Cotta cream mixture over the gelatin and stir until the gelatin is completely dissolved. Divide the Panna Cotta mixture into your serving cups (I used little vintage crystal tea cups), then chill them until firm, which will take at least two hours. If you’re going to chill them longer, cover them with plastic wrap once they’ve cooled down. If you want to create Panna Cotta molds, lightly grease the interiors of your selected molds (using a neutral tasting oil) before pouring the mixture in. Then, once it’s set, you should be able to run a sharp knife around the edge of the mold and drop the set Panna Cotta onto a plate or bowl. Kirk and I are traveling to Chicago tomorrow, so I’m signing off until next weekend. I’ll be enjoying an evening with friends at the Purple Pig and an afternoon of tea and a fashion show at The Peninsula (if only I also had time for Ethiopian Diamond, Hot Chocolate, and Sweet Maple Cafe – – – I guess there’s always our next trip). I’ll tell you all about it when I’m back. I hope everyone has a great week!